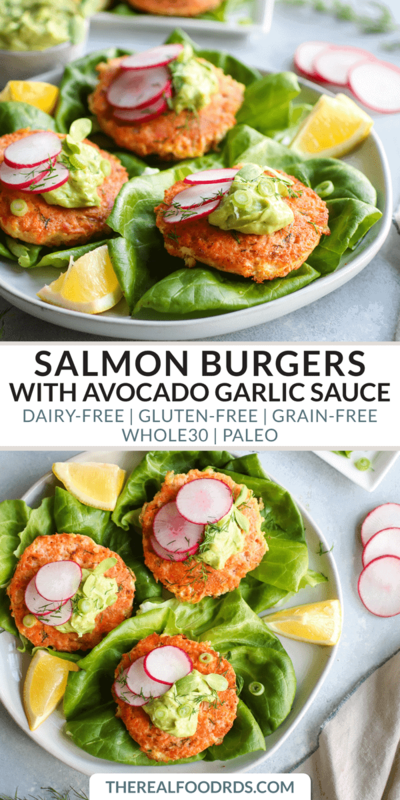 Flaky Salmon Burgers are rich in omega-3s and topped with a flavorful Avocado Garlic Sauce. 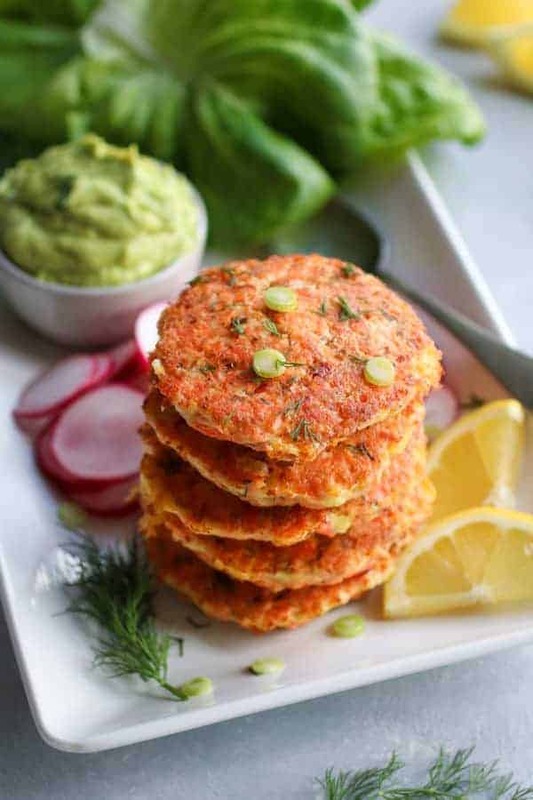 Make Salmon Burgers part of your menu this week! 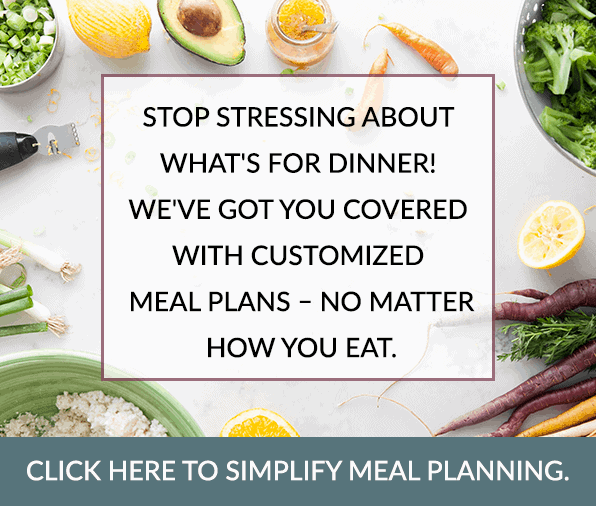 Are you stuck in a dinner rut? 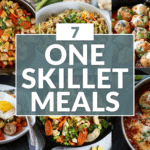 Having the same ‘ol meals week after week? It’s time to change it up and give these burgers a try! 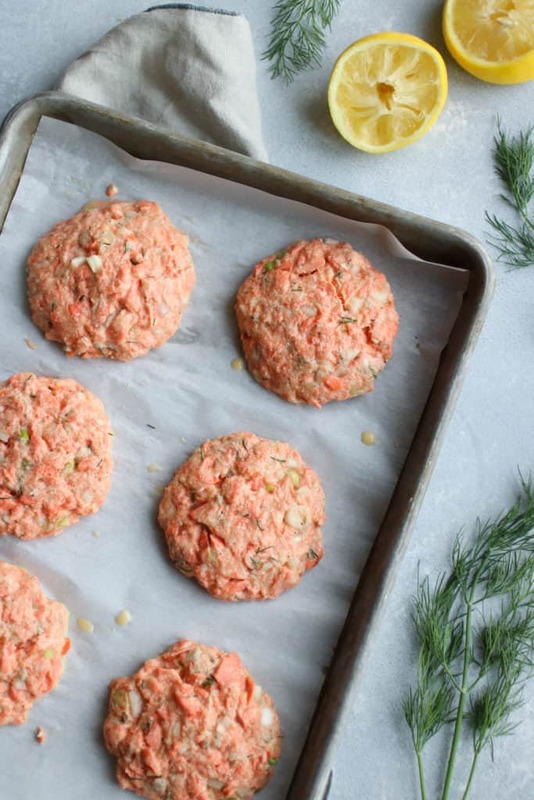 Salmon Burgers are made flavorful with fresh dill, minced shallots and lemon juice. They’re quick to make and nutritious, providing an adequate source of good quality protein and healthy omega-3 fatty acids. These burgers are a great way to use up leftover salmon. In fact, whenever I make grilled or broiled salmon for dinner, I purposely make extras so that I have enough for Salmon Burgers the day or two after. 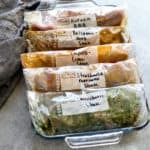 With that said, you could also cook up a couple of salmon filets during your weekend meal prep to help save yourself some time during the week. Toss all of the flavorful ingredients in a bowl, mix, form into patties and cook. But before you get cookin’, here are some pointers for making these Salmon Burgers. When forming patties, you’ll notice they don’t stay together all that well…but no sweat! As you begin to cook the burgers, the eggs will start to cook and hold the burgers together. Handle the patties carefully when forming and when transferring to the pan to cook. Make sure the oil is nice and hot before adding the patties to the pan. If you feel that the salmon burger mixture is too “watery,” feel free to add an extra tablespoon or two of almond flour. We love salmon for many reasons! Not just taste, but nutrients too – it’s a nutritional powerhouse for sure. Excellent source of Omega-3 fatty acids containing up to 2 grams in 4 oz. (This is half of most people’s daily needs.) The Omega-3s found in fish come in the form of both DHA and EPA, two Omega-3s that our bodies thrive on and can easily absorb. DHA is known to be the most important fat in the brain. This fat improves both mood and cognitive health. Increased intake has been shown to reduce risk of depression and the cognitive decline that occurs with aging. EPA is known to improve joint health and reduce inflammation in the body which helps alleviate any pain associated with inflammation. Diets high in Omega-3s improve cardiovascular health and reduce the risk of heart attack, stroke, high blood pressure, and high triglycerides. Salmon is also an excellent source of Vitamin B12, Vitamin D, and Selenium. Read more about the nutritional benefits of salmon at www.whfoods.com. Oh, and quality matters too! Choose your salmon wisely. We always recommend purchasing fish that is of good quality and wild-caught. My go-t0 salmon comes from a Minnesota company called Surrender Salmon. It truly is the best salmon! The owners themselves are the fisherman and make several trips to Alaska each year to catch the salmon. So if you live in MN, I highly recommend you look them up or find them at a couple of the local Farmers Market’s in Minneapolis. Bottom line: When purchasing fish, you want to make sure that it supports the environment and is sustainable. The Monterey Bay Aquarium in California evaluates fishing practices around the world and rates sustainability based on the following criteria: inherent vulnerability of the fish, effects of fishing on the overall habitat, the status on the stock, and the nature of the by-catch. They have found that wild-caught Alaskan salmon is the most sustainably sourced of all salmon. Watch this video to learn more on this topic. As you can see, I’m pretty passionate about the topic of food quality and could go on and on. Maybe a future blog post on sourcing quality seafood?! How about that Avocado Garlic Sauce?! 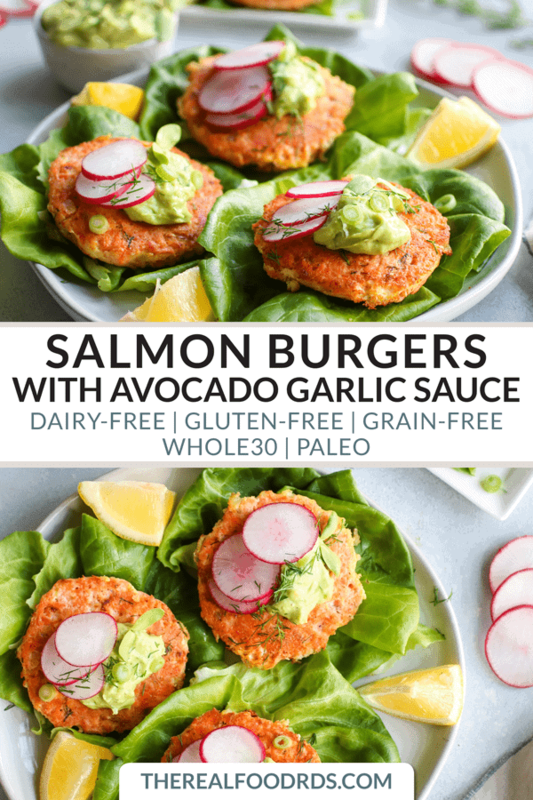 Top Salmon Burgers with this delicious and creamy Avocado Garlic Sauce. When I think about how I should make salmon or any fish for that matter, lemon and dill always come to mind. This sauce is not only made with avocado and garlic, but it also calls for lemon juice and dill! It’s versatile in that it can also be used as a veggie dip, a topping on a salad or used in place of mayo to make a creamy chicken salad. I hope you’re ready to give this recipe a try! 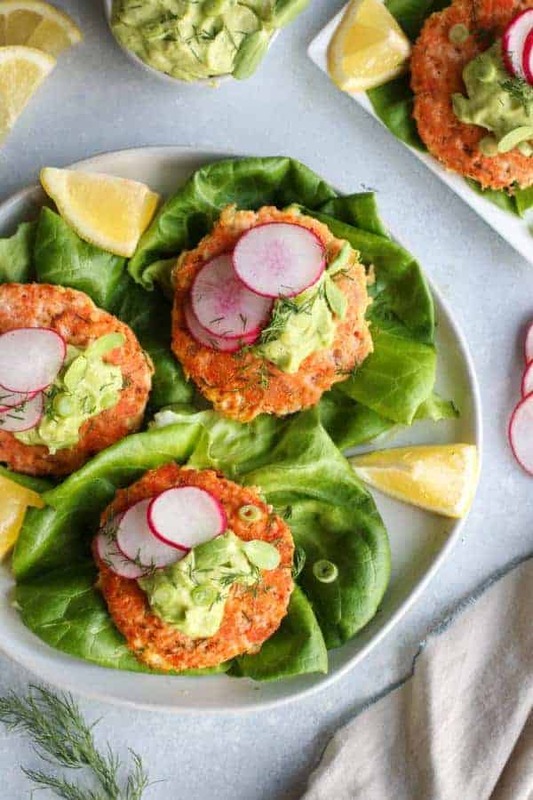 Serve these salmon burgers on top of a salad, in a lettuce wrap or simply as is. They even make for a delicious afternoon snack that’s full of protein and healthy fats to keep your body and mind energized until dinner. 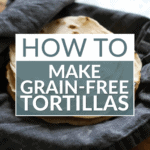 This recipe is gluten-free, Paleo and Whole30-friendly. In addition, it is also freezer-friendly. Simply place in an airtight container, separate each burger with parchment paper and freeze for up to 3 months. Reheat from frozen in a pan over medium-high heat. Serve these burgers over a bed of greens or tucked into a crisp lettuce wrap. Top with freshly squeezed lemon juice and a dollop of Avocado Garlic Sauce. 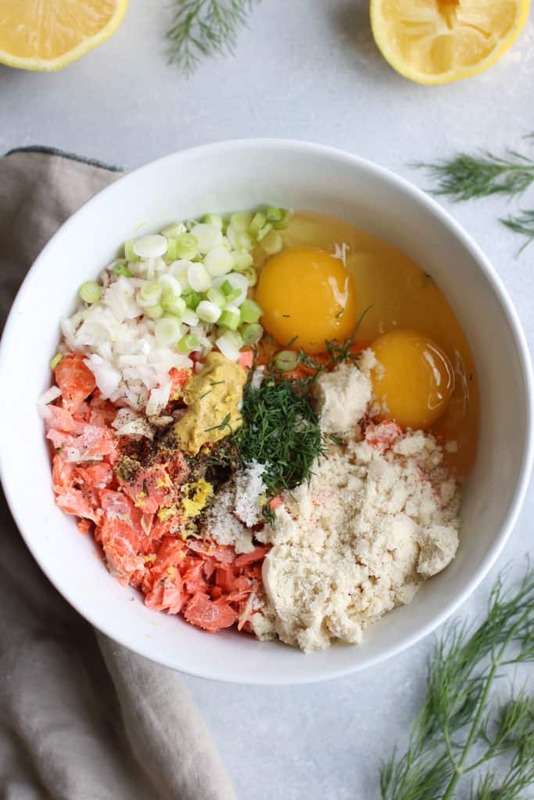 Combine all of the salmon burger ingredients, except the coconut oil, in a large bowl and mix well. If mixture is pretty wet, add additional almond flour 1 Tbsp. at a time. Form into 6-8 patties. Patties easily fall apart until they are cooked. Handle with caution. Heat coconut oil on a griddle or pan to medium-high heat. Once hot (oil must be hot), carefully add burgers to pan and cook for 5-6 minutes on each side or until cooked through. Patties should sizzle when added to pan. To serve, top with 1-2 Tbsp. 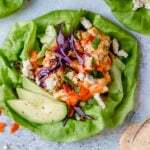 avocado garlic sauce and tuck into a lettuce wrap if you wish. 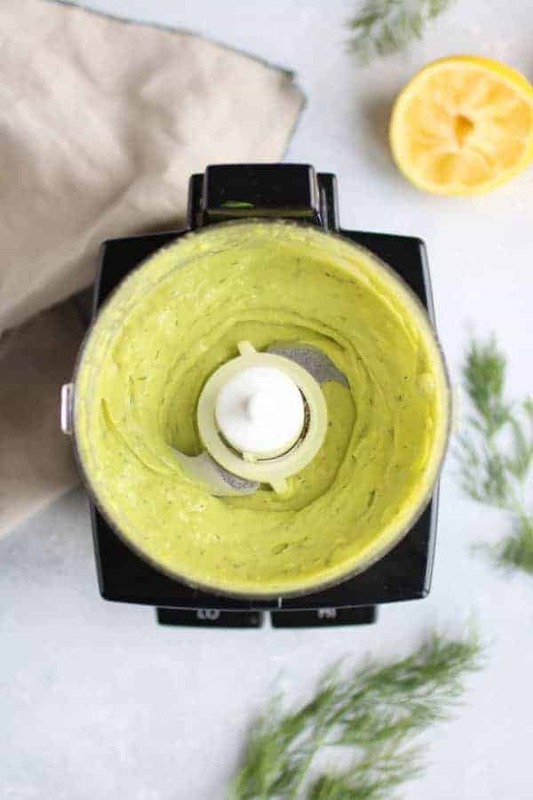 In a food processor or blender, combine all of the ingredients and process until smooth. Do you like fish? If so, what is your favorite kind? We’d love to know so that we can create recipes based on your favorites! You mention dull and vinegar in the avo sauce recipe directions, but not in the ingredients… Could you clarify? Sorry about that! There is no vinegar in the recipe and it should be 1 Tbsp. fresh dill (or 1 tsp. dried dill). I’ve updated the recipe. These looks fantastic! Love a good salmon burger and the avocado goes so well with fish. Will be trying these for sure. Thank you! We’d love to hear what you thought of them, Irena! 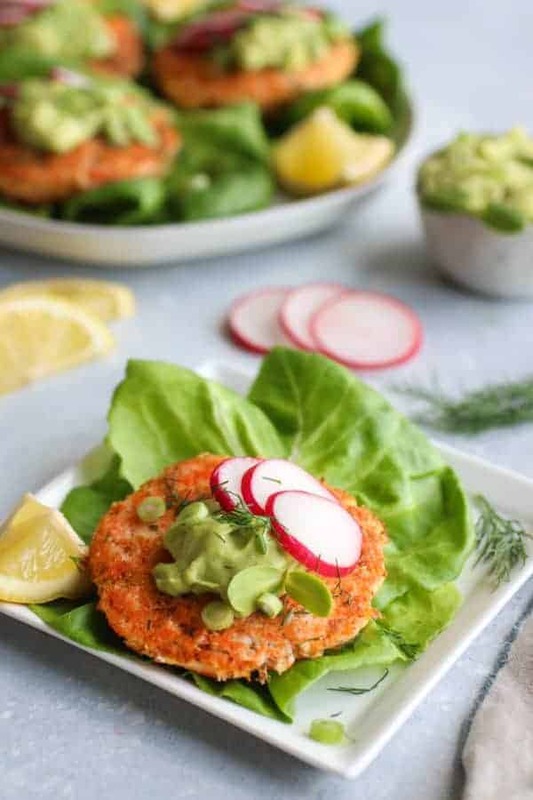 I love salmon burgers, I can’t wait to make this one! Oh my goodness they’re so good! And the Avocado Garlic Sauce adds another level of deliciousness! Enjoy! On several of the ingredients a “?” is listed instead of a true amount of tsp. Can you tell me what those amounts are? It happens in the salmon burger recipe and the sauce recipe. Thanks! So excited to make these, but dumb question; if you are using fresh salmon instead of canned, do you cook the salmon first? Trying to figure out how to make the burgers with a fresh slab of fish – cut it up? Thank you! 2.) Chop the raw fish into small chunks (1/4-1/2 in) then mix into the remaining ingredients. You may need to cook the patties a bit longer to ensure they’re cooked through. I had the same question! Glad I looked here before asking;) Any opinion on which version you like better? Precooked or raw? 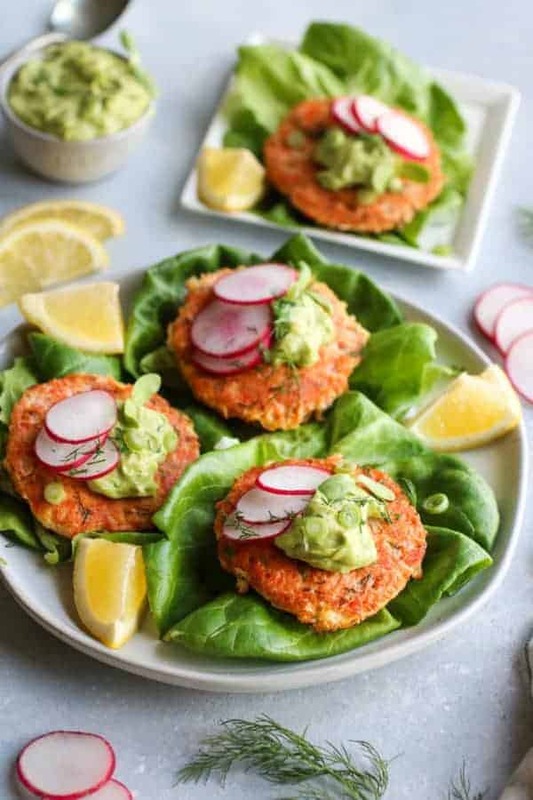 I actually prefer to use cooked salmon – I usually put baked or broiled salmon on the menu for one night (doubling the amount we’ll need so there’s enough left over) then using the left over cooked salmon for the salmon cakes a couple days later. Hope that helps! these are SOOOO delicious! my kids and neighbors love them too! no need to measure ingredients , put in what you have on hand. omg yummy! We’re so happy to hear you, your kids and neighbors love them! Thanks so much for the feedback. How long will the avocado sauce last before it turns black? The sauce should last at least a day or two before it darkens. I always press a small piece of parchment paper onto the surface of the sauce before putting the lid on the container – that seems to keep the surface from browning as quickly. Hope that helps! Had the salmon cakes tonight. The best I have ever eaten and my husband agreed! Would love to see some recipes using cod. Thank you so much for making it possible for us to have a delicious dinner tonight! 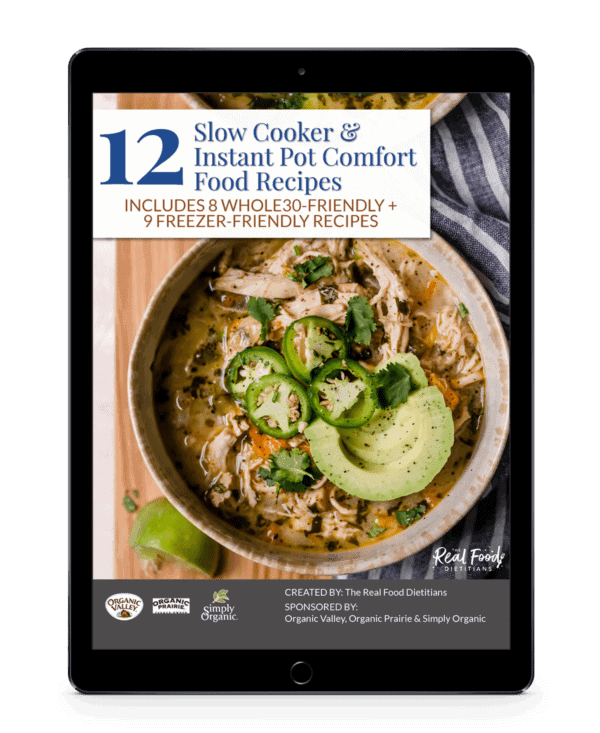 We love hearing when our recipes are a hit! Great suggestion for recipes with cod – we’ll see what we can whip up! Quick, easy, and tasty! Thank you for another fabulous recipe. I have made these for dinner before and we devoured them! Absolutely delicious! Just wondering if you think they would reheat okay in the microwave? Thinking of making a batch for lunches at work…. thanks! Awesome! Yes, you certainly could reheat them in the microwave. Perfect for leftovers! Just made and enjoyed these tonight. The use of avocado garlic aioli for a topping, mixed with the traditional flavors of lemon and dill that compliment the salmon, did not disappoint! Hubby said “it’s a keeper!” We used canned salmon. I served the patty on top of a pretty hefty bed of raw power greens (baby kale, chard, arugula, etc) that was lightly dressed with olive oil, salt and pepper. I liked the idea of cayenne pepper, but didn’t want it to over take the flavors, so I put a dash of cayenne on top of the avocado aoili prior to serving. Just right for us since we don’t “do” lots of spice. Also we added gently steamed fresh broccoli as a side. Thank you! That sounds delicious! Glad you and your hubby enjoyed this recipe! We made these last night and really loved them! My boyfriend is very good at not overworking a mixture that I’ll make and makes some great patties. He was worried about how wet they were at first, but once the egg began to cook, they held together so well. 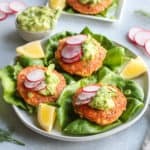 I love salmon burgers and these will definitely be in my bi-weekly meal rotation. PS- the cheapest and tastiest wild sockeye is in the frozen section at Trader Joes. Defrosts quickly too. Thank you! Awesome Audra! Happy to hear you and your boyfriend enjoyed the Salmon burger. When I use canned salmon in this recipe I really try to drain as much liquid off as possible. That will make the salmon easier to handle and form into patties. Good to know about the Trader Joes find…I’ll keep that in mind! Thank you! Instead of cooking the patties in the pan, is it possible to cook them in the oven? Thank you! Can’t wait to try the recipe! You sure can. The cooking time may be longer and your won’t get as crispy of a crust on them but it will work. 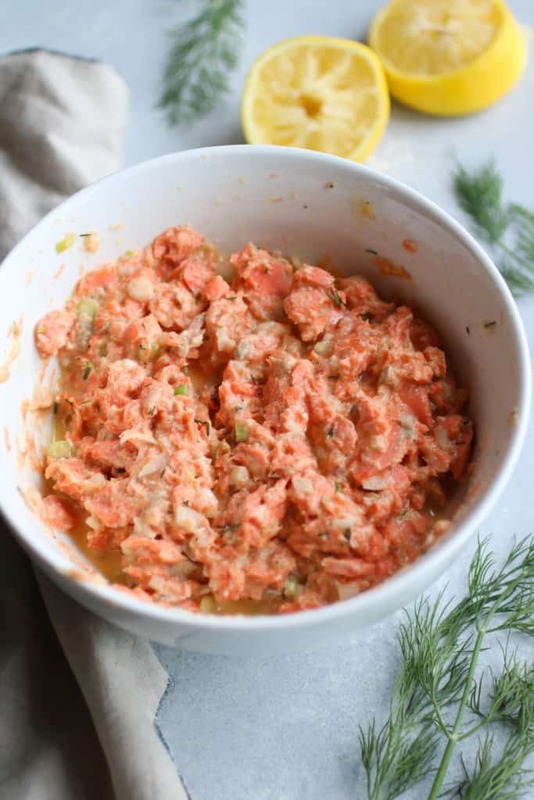 2) Start with raw salmon that has been diced finely or even pulsed in the food processor a couple times. Then stir in the remaining ingredients and use oiled or wet hands to carefully shape the salmon mixture into patties for frying. These are the two ways I’ve done fish (and crab) cakes being that I can’t eat eggs either. I hope that helps! JUST made these tonight. DELICIOUS!! The avocado sauce complements the patties perfectly!! Love!! Awesome! Great to hear you enjoyed this recipe. 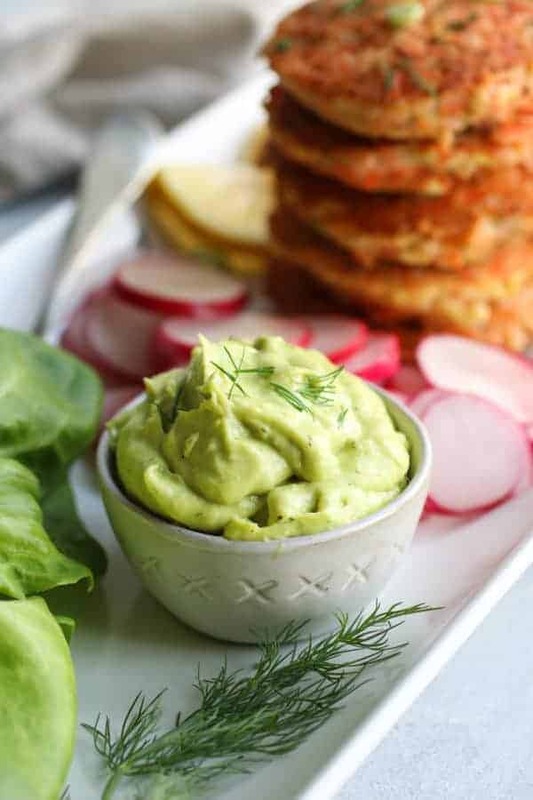 The avocado sauce is so so good and is very versatile. Hi. Question: if I’m having to substitute almond flour for regular flour, how much do you suggest using? I would start with slightly less regular flour than what the recipe calls for and add a little more as needed. Very good even without the avocado topping! 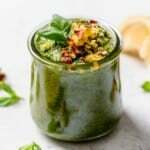 Is there a substitute that can be used in place of the almond flour? I have everything but that and would have no use for that flour otherwise. Thanks in advance! If you don’t need these to be Whole30-friendly you can substitute bread crumbs (gluten-free, if needed) for the almond flour or you can add a few teaspoons of flax meal in place of the almond flour. Note: I haven’t tried either of these suggestions but based on my experience with similar recipes that should work. Great flavor! I love how the same spices are used in the patties and the sauce. Easy to make, too. I cooked the patties on an electric griddle (with a thin coating ofcoconut oil) and didnt have any problems with them falling apart! So great to hear these turned out for you and you enjoyed the recipe! could you cook them in the oven instead? I suppose you could. They may not get as crispy and browned in the oven but that should work just fine. My whole family loves salmon burgers; excited to try these! Yes, a blog post on safe seafood would be an excellent topic! It’s especially difficult on a tight budget to include fresh salmon. Canned is often the only option. Thanks for sharing another awesome recipe! Hi Jodi! So great to hear! You’ll have to let us know how you and your family liked the burgers. And we will keep that topic in mind for a future blog post. 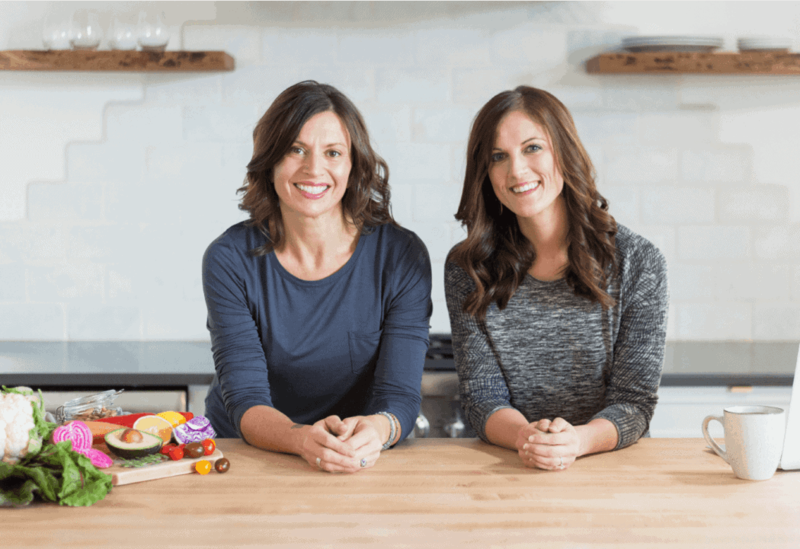 We’d plan to start infusing the blog with some really great information pertaining to real food. Interesting article! 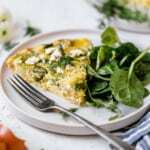 Thanks for sharing tasty and delicious recipe. I will definitely going to try this. I made these last night and they were amazing! I served them over a bed of lettuce with a fresh corn, cherry tomato and avocado salad on top. It was the perfect summer dinner! That’s so great to hear! This is one of my go-to recipes whenever I have leftover salmon on hand. And that salad sounds like the perfect companion to the burgers! Can i replace the almond flour with panko? These are so delicious. I made them back-to-back nights with salmon that we brought back from Alaska. I baked the salmon first, before mixing it into the other ingredients. My 6-year old devoured them, and I gave one to my dad. He’s hooked now and I had to make a double-batch for him to keep in his freezer. The sauce is delicious as well. Perfect flavor combination. The radishes were also a great touch. Thank you so much!! I just love everything about this 🙂 Thanks so much for sharing – we’re so happy you all enjoyed them! These look delicious! Could coconut flour be substituted for almond flour? If so, any idea what the ratio would be? We haven’t tried it but my guess is that you could add a pinch or two of coconut flour and see where that gets you texture-wise (my guess is that you won’t need much since coconut flour absorbs so much liquid). Thank you for this delicious looking recipe! I just want to make sure I’m understanding correctly. We are supposed to bake the salmon first, before putting the patties in the hot oil pan? Made this tonight for myself and leftovers for lunch – exactly as directed. Absolutely delicious!!! Can’t wait to make for my husband as well! Served with arugula(topped with salt, pepper, lemon juice, and evoo) as well as some roasted sweet potatoes! Used Great Alaska Seafood salmon burger❤️ Side of farro with roasted asparagus. Excellent!